Asus Eee Pad Transformer Prime 32GB review | What Hi-Fi? The tablet market already offers a wealth of Android alternatives to the Apple iPad, making standing out from the crowd a real challenge. The original Asus Eee Pad tablet (see second image, below) came with one obvious unique selling point – the addition of a keyboard dock, complete with its own battery and improved connectivity. 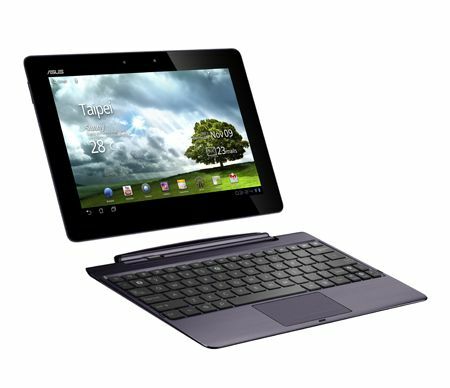 With an improved specification alongside the keyboard, the Asus Eee Pad Transformer Prime hopes to make an even more compelling case. Not only does the Transformer Prime's special keyboard dock slot nicely into place and form as desirable a package aesthetically as the tablet alone (it's pretty much a fully fledged notebook in this mode), it adds a whole host of functionality too. An extra SD card reader is joined by a very handy USB input, while the extra battery in the dock juices up the whole system to a healthy 18 hours of life. The keyboard feels fine to type on, if not quite as solid as a laptop, and means you can really edit documents using the suite of office programs. Rumours persist about a 3G-enabled version of the Prime, but that's still vapourware at the moment. Meanwhile, you'll have to tether it to your phone's data connection or use a 3G dongle in the USB port. Either way, it's plenty versatile. The Transformer Prime is certainly well put together, solidly built yet slim at just 8.3mm. There’s a 10.1in, 1280 x 800-pixel IPS LED screen powered by the new Android 4.0 ‘Ice Cream Sandwich’ operating system and a 1.3GHz quad-core processor. It should be no slouch. Connectivity is a bonus here, too, with a micro SD slot and mini HDMI output as well as a headphone jack. It’s as well specified as the best smartphones about in the camera department, too, thanks to an 8MP, 1080p-capable video unit. There’s a lower quality front-facing camera, too. As well as the apps, games and movies available on Android’s Google Play store, there are Asus-specific apps here, too: MyCloud is – you’ve guessed it – a cloud storage app that works nicely across Prime, PC and Mac, while MyNet is a DLNA streaming client. There’s even music, radio and video on Asus’s admittedly rather limited, and iffily named, asus@vibe store. You also get the Polaris Office suite, which works well with the keyboard dock. The screen looks good for web browsing, and the customisable Android 4.0 interface is faster than any Android alternative we’ve seen (and a close second to the iPad). There’s support for H.264 and MPEG-4 video, and pictures look good and smooth, with a subtle but detailed picture. Audio is lively, if not quite as insightful as the best. The rapid processor comes in to its own with demanding apps and games, coping admirably without lag.The Asus Transformer Prime is a powerful tablet with a clever USP and a level of performance that does it justice. With neat apps and extras such as cloud storage and DLNA, plus the keyboard dock that adds battery life, a USB input and its impressively easy-to-use nature, it should be on any tablet shortlist.